I feel this is a topic that could spark discussion as I have spoken about issues many people forget about (not just access). Hi everyone! 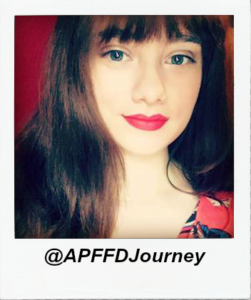 Today I’m going to be talking about my own personal experiences at some fantastic music festivals as a disabled person here in the UK. Disabled access information is a topic that you can’t find much information about when searching online, and the only way to truly know the struggles and the precautions you have to take as a disabled person is if you have spoken to someone that has already attended and can tell you all about what you’ll more than likely need to be cautious about. When I was attending my first music festival I did try to do a search online and couldn’t find anything to help and advise me.. I ended up having to just email the festival and hope for a reply – which was quite a pain! Proximal femoral focal deficiency (PFFD), also known as Congenital Femoral Deficiency (CFD), is a rare, non-hereditary birth defect that affects the pelvis, particularly the hip bone, and the proximal femur. The disorder may affect one side or both, with the hip being deformed and the leg shortened. Because of this condition, I have had to wear a prosthetic leg from birth, and undergone operations to fix the deformed leg including having the foot amputated. Like a lot of people, I absolutely love music! The chance to see my favourite performers live in person – how could I turn that down?! I was unbelievably excited but there was only one worry… would I be OK attending as an amputee? The first festival that I ever attended was Download Festival in 2014 – I couldn’t wait! I love rock music and some of my favourite bands were playing there, however like I said I was worried about how my disability would affect me at such a place. I found that emailing the festival with queries did prove to be helpful as they did respond fairly quickly however I think there could be much easier ways to receive information regarding disability at the festival and to have these queries and worries responded to immediately. I decided not to camp in the disabled campsite as in 2014 I was not struggling with pain from walking with my prosthesis as much as I am now – I was OK. The first thing that was a struggle was carrying my luggage.. I do suffer with lower back pain and even though I tried my best to pack lightly I was still unfortunately having a hard time. The festival did offer wheelbarrow type things to place your luggage in – but I would’ve struggled too much to push that and also.. they charged quite a lot of money for it! I had to rely on my helpful friends to make it to the campsite. Finally arriving at the campsite (about a 35 minute walk from the entrance) I was so exhausted just from the walk in – I had to take a break on a camping chair while my friends set our tent up. I don’t know what I thought a festival would be like.. but I had done so much walking already and even though I was in less pain back then than now it was still taking a massive toll on my body already! My cousins shoes.. you can see how muddy the festival was! I started to realize fairly quickly that I should have camped in the disabled campsite.. after a few days of walking in pain with my prosthesis and my poor back, I had to stay in the tent for the last day of the festival and purely rest. I need extra space in a toilet cubicle and I was happy to read that at Download Festival they have disabled toilets all over the campsites, not just in the disabled one. I have to say.. their disabled toilets weren’t much different to the regular toilets AT ALL which was quite disappointing! 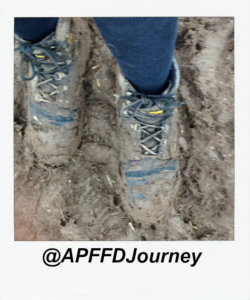 As you can see in the picture above – the mud was horrendous! I had not anticipated bad weather as this was a summer month and seeing the mud was heartbreaking.. knowing how hard things were about to become walking with my prosthesis. Wearing my prosthesis and attempting to walk through that mud was close to impossible and I really felt like just giving up! I asked a worker at the festival if they had any wheelchairs on hand that I could maybe borrow to get back to my campsite as I really felt I just couldn’t walk anymore.. but they had none. Also, I had to take medication during the day so I asked a worker while in the arena if I was able to have some water in order to take my tablet – and strangely they refused me? Even though I had seen other workers doing this for other people this particular worker told me that it wasn’t possible to hand out water? I do think that I made an error in judgement by not camping in the disabled area however there are some things that I feel Download Festival could have done to make life easier for those of us that still struggle despite not camping in the disabled campsite. • Keep in mind that it isn’t just access information disabled people are after; it’s everything! from walking distances to water points to what the ground is like. I still love music but unfortunately as my prosthesis is so hard to wear now I don’t think I will be attending another festival for a while (unless I feel comfortable using my wheelchair completely). Don’t forget to get in touch with me – I’d love to hear from you! And my social media pages are located at the top right of this page.